Are you a Canadian company considering a new investment? Are you interested in investing in Catalonia? Does your business need connections with the Catalan industrial and economic ecosystem? From the Catalan Government Trade & Investment office in Montreal, you get tailor-made information and full support for a smooth, fast and successful set-up of operations in Catalonia from start to finish. We also offer personalised assistance to Catalan companies wishing to open in Canadian markets and find new global business opportunities. Qualified support, insight and advice to Canadian companies interested in investing in Catalonia. Full, practical, up-to-date information on the legal, tax and labour context. Introduction to the Catalan industrial and economic ecosystem. In-depth information on financing and location possibilities. Help with the right steps to get started in Catalonia. Ongoing support throughout all the phases of the investment project. Promotion of strategic business alliances between Canadian and Catalan companies. Identification and location of Catalan technology partners for joint R&D and innovation projects. Help source suppliers, manufacturing partners, technology providers or any other local company to fulfill a specific need. Starting September 21st, 2017, Canadian companies enjoy a greater access to one of the world's largest markets, the European Union, as the Comprehensive Economic and Trade Agreement (CETA) enters into force. Over 98% of Canadian goods will be able to enter the EU without tariffs. The agreement gives companies access to a $20 trillion market. There are many Canadian companies already established in Catalonia, such as Magna, Enghouse, CAE, Bombardier, Lasalle College International, Dorel, Solium, Domtar and Lallemand. Some of them have been assisted by Catalonia Trade & Investment. Lasalle College International, the Canadian based education network, chose Barcelona to set up its first European Campus, via an alliance with the fashion school Felicidad Duce. "The campus in Catalonia is a strategic destination for the LCI Education network. As a quintessential cosmopolitan city, Barcelona perfectly reflects the key aspects of our network: dynamism, avant-garde fashion, design and diversity,” remarks Claude Marchand, President and CEO of LCI Education. A number of Catalan companies are already established in Canada, among them Werfenlife, Trifermed, F Iniciativas, Tecalum, Mecalux, Scytl, Almirall, Punto Fa, Puig, Freixenet, Abertis and Pedelta. 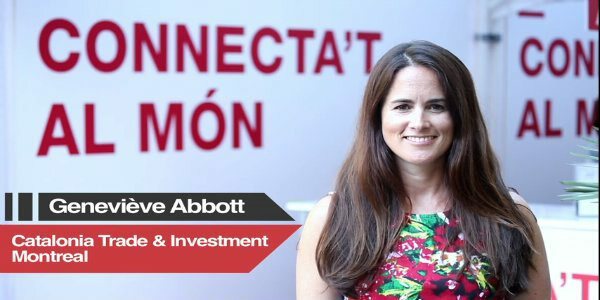 Ms Geneviève Abbott, director of the Montreal office, holds a degree in History from Carleton University in Ottawa and an International MBA from the Schulich School of Business at York University in Toronto. She complemented their training at ESADE in Barcelona. Prior to that, she worked at one of the leading Canadian engineering consultancy firms. She also worked as a market analyst for the Canadian Trade Commissioner Service in Guadalajara, Mexico. The Financial Times sees Catalonia as the best Southern European Region of the Future in its latest report on the most attractive European locations for future investments. With more than 8,600 international companies in Catalonia, Barcelona comes first in the continent by FDI strategy and policies for attracting investors.